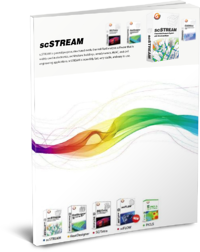 scSTREAM is one of the newest products in the MSC Software portfolio. It aims to make the job of simulating fluid flow and heat transfer easy and accessible to more Engineers than traditional Computational Fluid Dynamic (CFD) packages. The movie below shows a quick demonstration of its use for a simple thermal assessment of a small electronics package. scSTREAM is general purpose, structured mesh, thermal-fluid analysis software that is widely used in electronics, architecture, buildings, aerodynamics, HVAC, and civil engineering applications. scSTREAM is incredibly fast, very stable, and easy to use.